Milton Glaser A'51, the renowned artist and designer, returns to his alma mater for a free, public discussion on "The Design of Dissent." 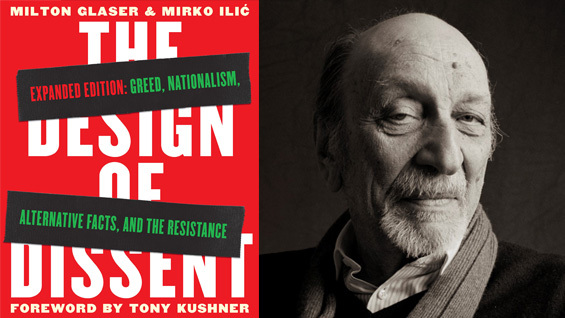 Following the conversation with designer Steven Heller, there will be a book signing of the 2017 updated version of Glaser's The Design of Dissent (co-authored with Mirko Ilic), newly subtitled, "Greed, Nationalism, Alternative Facts and the Resistance." For 33 years Steven Heller was an art director at the New York Times, originally on the OpEd Page and for almost 30 of those years with the New York Times Book Review. Currently, he is co-chair of the MFA Designer as Author Department, Special Consultant to the President of SVA for New Programs, and writes the Visuals column for the New York Times Book Review.